Funny that I should say “cool”. Our new console has twice now done something that we never, ever saw on our previous unit: the 2-red-quadrants-of-shut-offed-ness. Ever seen this? Evidently this is the message that your Xbox 360 has reached some sort of internal temperature threshold, and then shuts itself down. Microsoft even has a KB article on this. This “behavior is by design”, I imagine. I’m guessing that the (almost certainly) heat-related RRoD issues are now dissuaded by lower temperature thresholds in the Xbox. To be fair, we’ve always kept our console in a TV cabinet. Evidently this is an undesirable situation, as the (above) KB article states…. “Do not put the Xbox 360 console in a confined space, such as a bookcase, a rack, or a stereo cabinet, unless the space is well-ventilated.” Guess what? That’s where we keep our entertainment stuff! Now we’re just leaving the doors of the TV cabinet open while we use the X360, but at the expense of our hearing and sanity. Geez these things are loud. Too loud. WAY TOO LOUD. Meanwhile, the rest of the getting-our-Xbox-up-and-running-again experience has been fine. Our profiles and saved games were all fine. Connecting to our wireless required re-entering the key, but that’s easy-to-do. All in all, a fairly smooth transition. 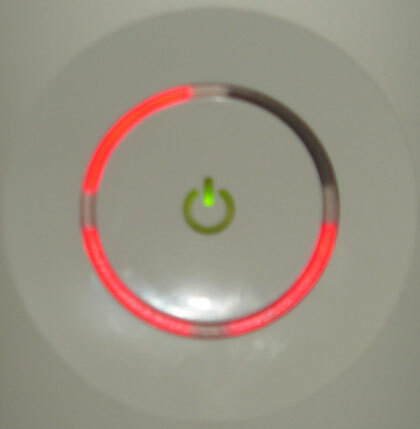 For the unlearned among us, that is the infamous “Red Ring of Death”. I’ve heard about it for the past couple of years now, but had never actually seen one in person. Until now, that is. Strangely enough, my buddy (and neighbor) EJO was also recently inflicted with the RRoD. 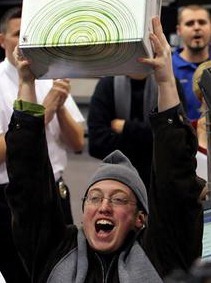 My X360 was a tried and true “launch” console, and EJO purchased his shortly thereafter launch. 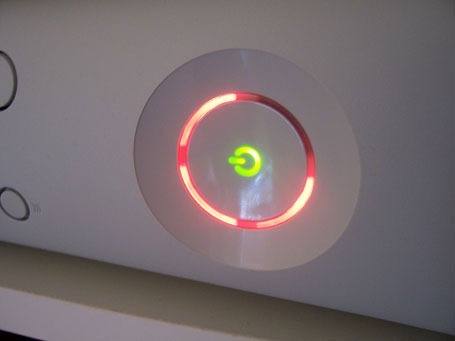 Anyhoo… Microsoft has extended support for the Xbox 360 to 3-years in cases involving the RRoD. That’s a good thing, since my box (a gift from my brother, I might add) is over 2 1/2 years old! Certainly well out of the standard 1-year warranty. To take advantage of this extended warranty, simply go to Xbox.com, click on the Support link, and then click on the ‘Repair Your Console’ graphic on the right-hand side. It’s just that easy! Well, it should be. To be perfectly honest, I ended up contacting the Xbox Support team five times. For 3 days in a row, their support ticket system was down for “updates”. Not cool. Equally as aggravating is their voice-activated phone system which makes me feel like an idiot for talking to no one, while simultaneously extending my hold times. Thanks, Microsoft. For whatever reason, I’d have to reiterate the entire issue + my steps to resolve it each and every time I called. Perhaps that was due to the “updates”, but it’s still frustrating. All that said, my final call to Microsoft was easy and well-handled. A prepaid shipping label was emailed to me — you can also opt to have a labeled physically mailed to you, or an entire shipping box — and I received it within hours. I packed up the Xbox — minus my custom faceplate, wireless receiver, and harddrive — and shipped it off. I should see it again within 2 weeks, or so I’m told.